One of London's iconic statues the girl and dolphin. Thousands of tourist photograph it every year generally from the other side so Tower Bridge is in the background. 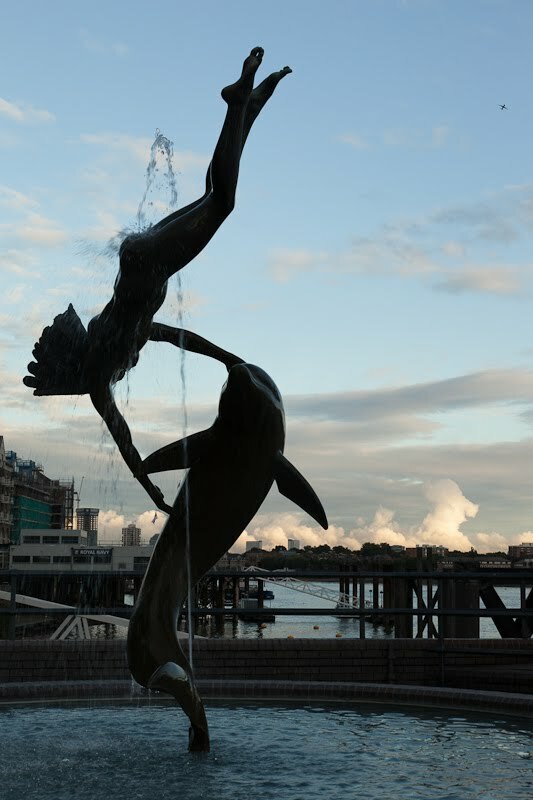 Sculptor David Wynne also did the boy and the dolphin, that is considered to be the better of the two. This one is in Chelsea. He used his 10 year old son for the model when he created the piece in 1961. A rather sad plaque was added in 1999 when his son died. Great shot, Mo. BTW I've just got to 50 over at Look-for-longer! Very sad story. Wonder what the son died of. Rather young to die. I remember this sculpture but, I don't have a photo of it. I wonder how that can be. So much joy in this picture (as well as retrospective sadness). It makes one think 'I wish I could do that!'. Very lovely and even more poignant knowing of sadness in its story.